After seeing the movie, I was compelled to find out more about Meirelles and what led him to make such a bold film. I discovered Meirelles received a movie camera while living in Brazil at a young age, and it became a hobby. It then made obvious sense to me why he was drawn to this project because he was clearly drawn to the character of Rocket and the parallels between how art saved them. The painstaking lengths to which Mierelles goes to make sure that his vision hits you like a sucker punch the chest is incredible, yet it is even more incredible how hard he lands that punch. I was in tears as the city’s crime lord forces a new recruit to slowly kill an innocent child. The bleak, unsparing city that Mierelles is able to put on the screen before you is tough to watch. But at the same time, he is able to bring such a vibrant and eclectic stylistic angle to the environment that I think “City of God” is a movie that I will want to watch over and over again. 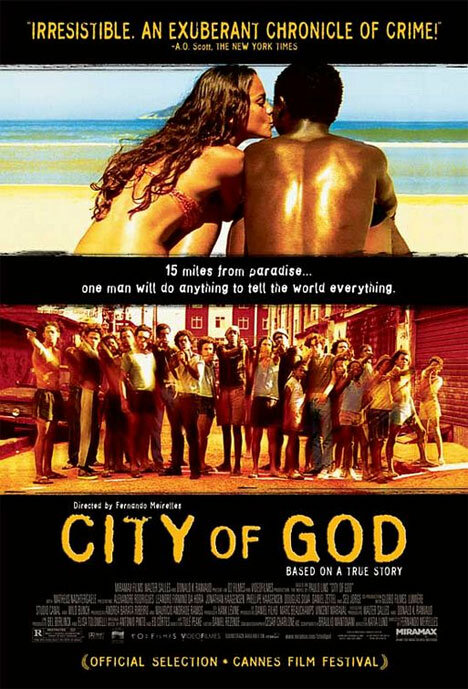 Great description of “City of God” — it is like a Brazilian “Goodfellas,” but it’s also one hell of a coming-of-age movie and a drama, too. Fernando Meirelles is rapidly becoming one of my favorite directors (“The Constant Gardener” was his handywork, too). I have “The Constant Gardener” saved on my TiVo … in fact, I have for almost nine months. It’s on sale for $6.99 on iTunes, so I’ll try to watch it this week to save on buying it if it’s really that good.